Born in Buenos Aires in 1899, Borges was a voracious reader from childhood, perhaps in part because he knew he lived under an inescapable sentence of adult-onset blindness inherited from his father. Wilson chronicles Borges’s life as he raced against time and his fated blindness, charting the literary friendships, love affairs, and polemical writings that formed the foundation of his youth. Illuminating the connections running between the biography and fictions of Borges, Wilson traces the outline of this self-effacing literary figure. Though in his later writings Borges would subjugate emotion to the wild play of ideas, this bracing book reminds us that his works always recreated his life in subtle and delicate ways. Restoring Borges to his Argentine roots, Jorge Luis Borges will be an invaluable resource for all those who treasure this modern master. The idea of such a marvellous machine had been around for centuries. René Descartes (1596-1650), whose philosophy was bound up with mathematics, wondered whether a machine could be made to think; but generally the notion was considered as unlikely as turning iron into gold, another fantasy that occupied great minds. Now here was Mr Simon disturbing his class on a sleepy afternoon in Chicago in 1957 with his improbable claim for computers. But can artificial intelligence, AI as insiders call it, really be dignified with, well, “intelligence”? Is this what Descartes had in mind when he wrote, “I think, therefore I am”? A machine will deliver a bar of chocolate in return for a coin, provided it is working, but not even a child believes it is a thinking instrument. A computer is a machine, however intricate. Is it no more than a number cruncher? For more than 40 years Mr Simon was regularly interrogated about his claim that there was little difference between a suitably programmed computer and the human brain's use of neurons. He usually answered questions with good grace, but he refused to give ground. 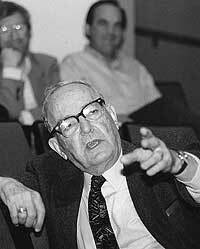 In 1978, Herbert Simon was awarded the Nobel prize for economics. What for many people would be regarded as the culmination of a life's work, Mr Simon took almost casually, a diversion. The Swedish judges at the presentation ceremony were a touch hurt to hear that artificial intelligence had been his central interest, rather than economics, although of course he was interested in that discipline too. But to those who knew him such versatility was no great surprise. He dabbled in many things, usually with great accomplishment. What he called “social science” took a hold on him, but he could probably have made a career as a pianist or a painter. His parents were German immigrants who, like many before them, had settled in Milwaukee. While still at university he had a part-time job with Milwaukee's local authority and became interested in how the administration made budget decisions, or choices as Mr Simon preferred to call them. Years later “Administrative Behaviour” was the subject of his doctorate, and later still the dissertation was turned into a book of the same name, probably the best known of Mr Simon's 20 books. It was his ideas on decision-making, especially in business, that caught the eye of the Nobel judges. Like many economic theories, Mr Simon's seems obvious once you know it. In taking a decision, he said, no business could process satisfactorily all the “zillion things” affecting the marketing of a product, in the hope that the right answer for maximising profit would pop out at the end. That was classical economic theory, he said, but it was “a ridiculous view of what goes on”. Rather, a business tried to make a decision that was “good enough”. He called his theory “bounded rationality” and invented a name to describe it: “satisficing”, a composition of the words satisfy and suffice. Not all economists agreed with Mr Simon. “But they are mistaken,” he said. His views on economics tied in with his ideas on artificial intelligence. Even a computer displayed its intelligence by making choices, he said. Like a human, a chess computer would analyse the consequences of a move, but it would do better than even a grandmaster, who would be unlikely to see beyond eight moves ahead. But what about insight? Or indeed wisdom and creativity? Mr Simon tended to be dismissive of such vague human terms. His computers had created drawings, which he was happy to display in his office, and music, which musicians said had aesthetic interest. They had made choices, as a human artist or musician would. For many people, artificial intelligence suggests Hal, the worryingly clever human-like computer which rebelled in the film “2001”. Although Mr Simon sometimes seemed to suggest that a Hal was just around the corner, he was not going to be drawn into comparisons with science fiction. His strictly scientific aims, he said, were limited to using computers to understand how humans think, and as an aid to human thinking. What about the soul? No one, he said, would tell him what the soul was. When someone did, he said thoughtfully, he would program one.